I believe with all my heart that civilization has produced nothing finer than a man or woman who thinks and practices true tolerance. I suspect that even today, with all the progress we have made in liberal thought, the quality of true tolerance is as rare as the quality of mercy. No matter what happens, the U.S. Navy is not going to be caught napping. Some one has said that most of us don’t think, we just occasionally rearrange our prejudices. God did not intend the human family to be wafted to heaven on flowery beds of ease. 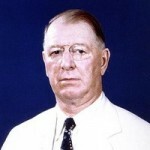 William Franklin "Frank" Knox was born in Boston, Massachusetts, USA. He was an American politician, publisher, and soldier. He was also the Republican vice presidential candidate in 1936, and Secretary of the Navy under Franklin D. Roosevelt during most of World War II. During the Spanish–American War, he joined the Army, and served in Cuba. After the war, Knox became a newspaper reporter in Grand Rapids. During World War I, he was an advocate of U.S military preparedness and then of participation in the war. When the U.S. declared war on Germany, he rejoined the Army. He reached the rank of Major and served as an artillery officer in France. In 1930, he became publisher and part owner of the Chicago Daily News.